Jennifer Mckay, a 38-year old research librarian with the University of Alaska, remembers the day back in 1997 when she was invited by a Navajo friend to the First Mesa, a three-hour drive east of Ganado where Mckay, an anthropology major, was interning at the Hubbell Trading Post. On the mesa located within the Hopi reservation, she witnessed a spiritual ceremony that few whites get to see. Admittedly, she was unaware of the five coal-powered generators at the Four Corner Power Plant (FCPP), 147 miles north of Ganado near Fruitland, New Mexico. 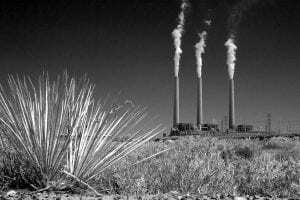 On property leased from the Navajo Nation, its five coal-fired generators emissions made this site one of the oldest, largest and heaviest polluters among the nation’s coal-powered plants. 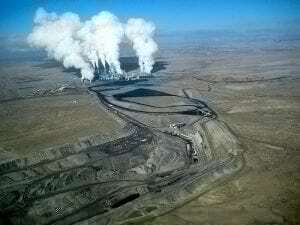 Its first coal-powered generating units went on line back in the early ‘60s. As additional units were added over the years, the FCPP remained woefully out of sync with the EPA’s Clean Air Act of ‘72: the plant was on track to spew some 100 million pounds of sulfur dioxide and nitrogen oxides (NOx), plus 6 million pounds of soot and nearly 1,000 pounds of toxic mercury annually. At first, a knee-jerk response might be to point blame at the owners of the FCPP, now wholly-owned by Arizona Power Service (APS) after recently buying out Southern California Edison’s share of the site’s three older coal-powered generators. But, the problem is not one-dimensional in cause or solutions. Indeed, it’s complicated with a Gordian-knot quality tied to a tangle of interpretations of federal land trusts for Native American tribes, and EPA mandates (Clean Air Act of 1972) and its more recent Regional Haze Programs; the latter offering its own Cross-State Air Pollution Rule to polluters as a way to reduce haze versus retrofitting old power plants to control the sulfur dioxide/nitrogen oxide emissions affecting our national parks and wilderness. Sadly, the twists and turns of rulings and hearings emanating from environmental and economic coalitions seem to be running parallel to more pressing issues of the day, such as a 50 percent unemployment rate within the Navajo Nation. Indeed, the high-paying jobs tied to coal are welcomed in spite of the continued swirl of hellish living conditions within the Navajo Nation. To further it’s long-term employment outlook, the Navajo Transitional Energy Company, LLC (NTEC), a wholly owned company of the tribal government, is moving to purchase the Navajo Mine from BHP Billiton New Mexico Coal, thereby burnishing its own commitment as a serious player in the coal mining business. It’s complicated: two other coal-fired power plants in the New Mexico Arizona region are also providing good jobs, but are major contributors to the ongoing environmental and health issues. Just 20 miles from the Grand Canyon, near Page, Arizona, this coal-fired power plant (2,250 megawatt of power) is deemed the mother-of-all contributors of acid rain in the U.S. It is co-owned by six entities deemed the ‘Technical Work Group:” the U.S. Bureau of Reclamation, Salt River Project, Los Angeles Department of Water and Power, Arizona Public Service, Nevada Power Company and Tucson Electric Power. Located just off the reservation near Farmington, N.M. with the ‘Public Service of New Mexico’ as primary owner/operator, this facility spews upwards of 18K tons of nitrogen oxide alone. A Sierra Club overview on SJGS points out that if a car is responsible for emitting 38 pounds of NOx, then this plant is doing what 940,000 cars can do; this, while fouling the air with 50 pounds of mercury; 662 pounds of selenium and 35K pounds of sulfuric acid annually. Furthermore, the pollution from this plant alone is a factor in contributing to the area’s 33 premature deaths, and prompting some 30 asthma-related ER visits to the tune of $254 million a year in health-related costs. For the Navajo Nation, stopping the use of fossil fuels in lieu of alternative energy sources is not a viable option, particularly since the coal needed to fuel both the NGS and FCPP power plants will be supplied by the aforementioned Navajo Mines. Hopefully, those “infinite” horizons will return, health-issues abate and tribal jobs flourish as these coal-fired power plants are one day deemed compliant after the retrofitting of outdated equipment.